To be eligible for financial support under the CEF, projects must be identified as Projects of Common Interest (PCI). The first Union-wide list of PCIs in the energy sector was adopted on 14 October 2013 (Commission Delegated Regulation (EU) No 1391/2013). For more about the process of identifying PCIs, see the specific page. The Commission, with the assistance of the Agency, carries out the evaluation and selection of submitted proposals. The process is supported by technical experts, whose role is to ensure that only the most high-quality proposals which best meet the award criteria as described in the relevant work programme and call text are selected for funding. 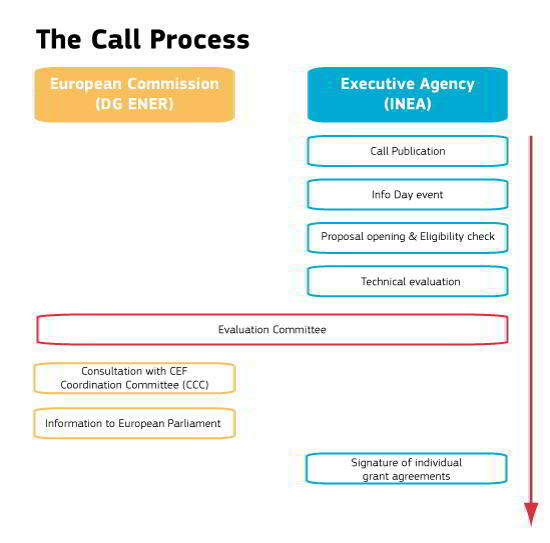 Proposals which meet the eligibility criteria and formal requirements specified for a call are evaluated on the basis of the criteria defined in the relevant work programme and call texts. Essentially, these relate to maturity, quality, cross-border dimension, positive externalities, the need to overcome financial obstacles, stimulating effect of the CEF financial assistance, priority and urgency, and complementarity with other actions financed by the CEF. A list of proposals recommended for funding is then prepared by Commission. Successful applicants are then invited by the Agency to prepare and sign individual grant agreements. For any questions relating to a specific call for proposals, please check the individual call page.